Posting an email address on a public web page is a recipe for disaster. It’s the way to get a metric truckload of spam. This, of course, makes it unfortunately difficult to allow visitors to a website to contact you without inviting the spammers in as well. The two primary methods used to combat this issue are contact forms, which have their own issues with spam, and obfuscation. There are plenty of pre-made contact form scripts, the better of which have some anti-spam measures in place (cforms and Contact Form 7 are popular options for WordPress). But what about obfuscation, for those times where it’s better to simply list the address rather than installing a whole form? A List Apart’s Graceful E-Mail Obfuscation is an interesting read, though their solution is a bit involved and requires a bit of server-side scripting for it to work. Perishable Press’s Best Method for Email Obfuscation? is a reasonable comprehensive guide, with plenty of clever methods to choose from, and pros and cons for each. I liked the techniques that involved writing the email backwards, or inserting null text in an HTML span, and using CSS to flip the text or remove the span of null text. Those two options don’t play nicely with copy/paste, though. If you’re a GMail user, you might like the idea of using a desktop client for your email, but can’t bear to give up the GMail way of doing things. That’s where the new Sparrow Mail app comes in. It also works with Google Apps accounts, so you can use it for your domain email. Sparrow is a very nice email client, and is available in the Mac App Store for a reasonable price. I’ve been using it out since the last week of the beta, and it has convinced me to stop using the GMail website for my day-to-day email reading in favor of Sparrow. 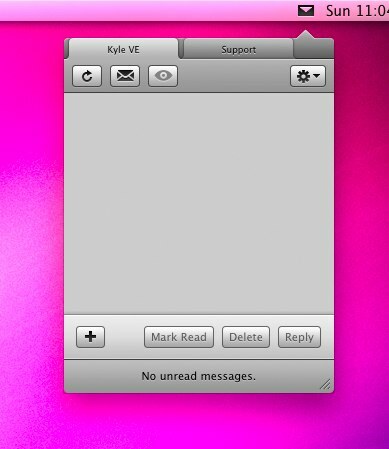 It complements the iPhone email client nicely in my daily workflow. OpenID is a good idea. While it may not be something you would want to use for financial sites or anything else requiring a higher level of security than your average web forum or social media site, it could potentially save a lot of time and effort on a daily basis. The authentication protocol’s biggest shortcoming is not the lack of websites support it, since more sites would implement OpenID logins if there were enough user demand; it’s not a shortage of OpenID providers either, since many large sites offer OpenID URLS. No, the problem is the users. The average web user just can’t seem to wrap their head around the concept. I was recently struck by an idea that might simplify the experience for non-techies. What if OpenIDs could be in the form of an email address? Everyone is familiar with email addresses, and many sites have already accustomed their users to having their email address as a login name. If you really think about it, email addresses are already what OpenID has set out to be: a persona that you connect various websites to. Imagine if GMail as your OpenID provider. To log in to an OpenId relying website you would input your email address, be sent over to GMail to verify, and then redirected back. I think it would be a little more user-friendly, providing that OpenID-providing email services made it clear that they offered the service. Until recently I used Google Notifier to monitor my primary Google Apps inbox for new messages, and I used Apple’s Mail application to check my other accounts. Then I found Notify 2, a neat little Mac application that works even better. Notify sits in your menu bar, up by the clock, and monitors multiple email accounts. It will check GMail, Google Apps, MobileMe, Rackspace, and generic IMAP boxes. When new messages come in, the number on the badge updates, and it can optionally make sounds or show Growl notifications. If the ability to monitor multiple accounts isn’t enough for you, this feature will win you over: You can do basic email tasks right from Notify. You can press the spacebar to open a full preview of an email. You can delete messages, mark them as read, or even send quick messages. It’s cut down on the number of times I’ve had to actually visit my inbox, as I can trash and quick-view messages without loading up the web interface. It’s $10 for the full version, with a trial, but the basic inbox monitoring features are still available after the trial period is over. TechCrunch has an interesting article up, titled PS: I Love You. Get Your Free Email at Hotmail, which is an excerpt from the new book Viral Loop: From Facebook To Twitter, How Today’s Smartest Businesses Grow Themselves. Smith wrote it down. He wasn’t sure about the “hot” part, but given everything else this seemed the best candidate. Then he noticed it contained the letters “HTML,” the acronym for “HyperText Markup Language,” the lingua franca of web pages. Email obfuscation is a useful technique to use to stop spammers from finding your email address (as opposed to the more common “munging” where you write “me [at] blah [dot] com”). An obfuscated email address is unreadable to humans and most robots in the source code, but is rendered correctly in a browser, and will function correctly in a mailto link. I’ve found it works well…but it’s a pain in the arse to do by hand. There are free online tools that will obfuscate an email address for you, but what if you want an automatic solution. I didn’t know this until WordPress Garage pointed it out, but it seems that WordPress has a built-in obfuscation function. It’s called antispambot(). The function antispambot() above parses the e-mail address passed by get_the_author_email() (this is the same as the_author_email(), except it returns rather than displays the author’s e-mail address). Use of the echo command displays the output of antispambot(). An interesting feature is it encodes only portions of an address, and does so randomly so the letters encoded are different each time the page loads, adding a little more firepower to the spam protection arsenal. The wiki page on WordPress.org has an example on how to use the function. Web applications, or web apps, have, in my opinion, one huge advantage over “normal” programs. I’m sure you can guess what it is before you finish reading this. I just got a new Apple MacBook, as I’ve Twittered about, told everyone I know on Facebook, and all but made a T-Shirt that says “I have a MacBook.” I’ve been trying to adjust to the new (to me) platform, and adapt my daily patterns. Do you have too many email accounts? Up until a few days ago, I did too. Every day I’d check several accounts for new messages, which took longer than I liked. My tip for today is too merge all of your email down into one account. GMail, and Google Apps, make this fairly easy. If you have a domain, I recommend using Google Apps. It’s much cooler to have you@yourdomain.com instead of domainlessguy73@gmail.com. Once your new GMail-based email account is set-up, head over to the “Accounts” tab on the settings screen. Here you will configure your account to be the one place you go to check your email.